Avendus topped the table in terms of volume of PE transactions advised, reporting 12 deals. Creedcap Asia broke into the top 3 advising 10 deals. Unitus Capital took the third place advising 9 deals. EY, Spark Capital and IndigoEdge shared the fourth position advising 8 deals each. KPMG completed the top 5, advising 7 deals. 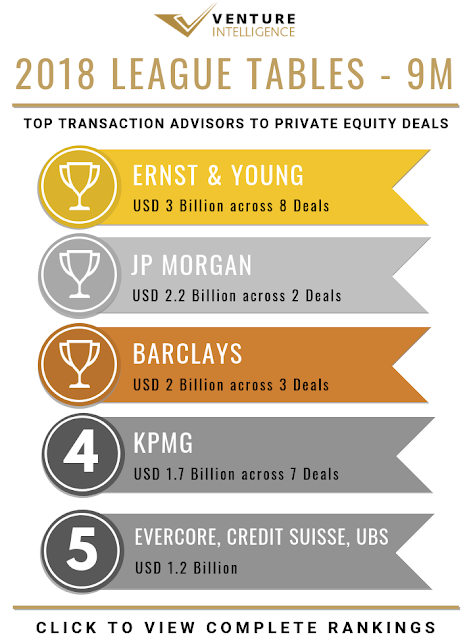 Inclusive of its roles in due diligence and related advisory activities, EY also topped the tables advising deals with a value tag of $7.8 Billion (across a total of 48 qualifying deals). KPMG came in at second spot advising deals worth $2.9 Billion. Barclays, Credit Suisse, Evercore, JP Morgan and UBS acted as financial advisors to Abu Dhabi Investment Authority and TPG Capital's $1.2 Billion investment in UPL Corp's acquisition of Arysta Lifescience. JP Morgan advised Oyo in its $1 Billion investment from SoftBank Vision Fund.